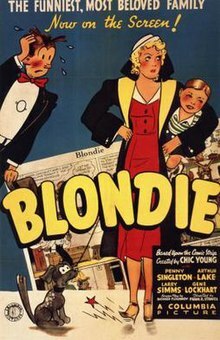 Blondie is a 1938 movie directed by Frank Strayer, based on the comic strip of the same title, created by Chic Young. The screenplay was written by Richard Flournoy. This was the first of 28 films based on the comic strip; Columbia Pictures produced them from 1938 to 1943, and popular demand brought them back in 1945. When the Blondie film series came to an end with Beware of Blondie in 1950, it was announced that it would be replaced with a series of Gasoline Alley movies. However, only two such films were made, Gasoline Alley (1951) and Corky of Gasoline Alley (1951). Columbia then reissued the Blondie features, beginning with the very first film in the series. Columbia used the series to showcase many of its contract players. Rita Hayworth was featured in Blondie on a Budget; Glenn Ford in Blondie Plays Cupid, Larry Parks and Janet Blair in Blondie Goes to College, Shemp Howard in Blondie Knows Best and Adele Jergens in Blondie's Anniversary. Other roles were taken by Columbia contractees Bruce Bennett, Lloyd Bridges, Ann Doran, Stanley Brown, Richard Fiske, Bud Jamison, Eddie Laughton, John Tyrrell, Alyn Lockwood, Jimmy Lloyd, Gay Nelson and Ross Ford.